Johann Adam Reincken (also Jan Adams, Jean Adam, Reinken, Reinkinck, Reincke, Reinicke, Reinike; baptized 10 December 1643 – 24 November 1722) was a Dutch/German organist and composer. He was one of the most important German composers of the 17th century, a friend of Dieterich Buxtehude and a major influence on Johann Sebastian Bach; however, very few of his works survive to this day. The individual movements in the original print of "Hortus Musicus" are grouped into six tonally closed trio sonatas with suite appendixes. 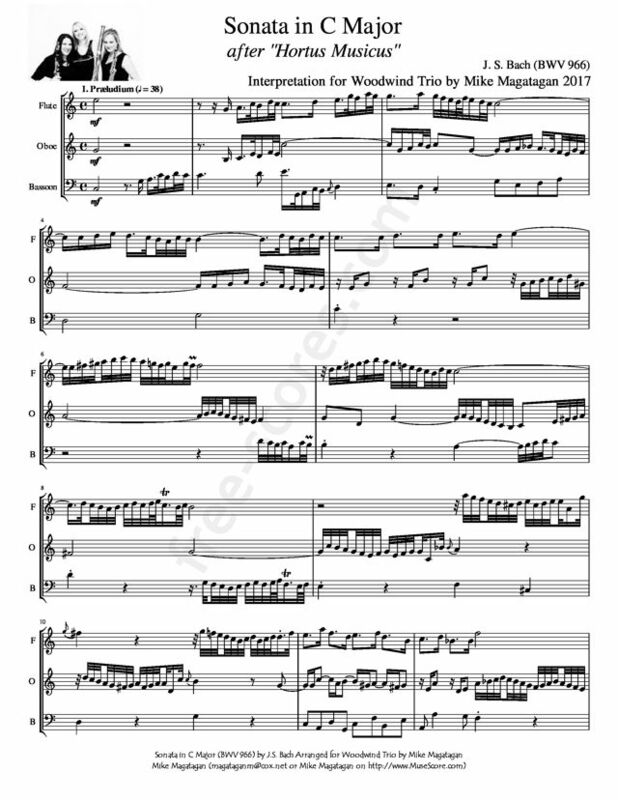 While BWV 965 encompasses an entire sonata with suite, BWV 966 includes the Sonata in C Major and the ensuing Allemande, and BWV 954 is limited to the imitative Allegro section of the Sonata in Major. To all appearances, this sequence corresponds to the course of J. S. Bach's study through arranging: he begins with the transcription of a complete sonata but then concentrates increasingly on the contrapuntal movements. 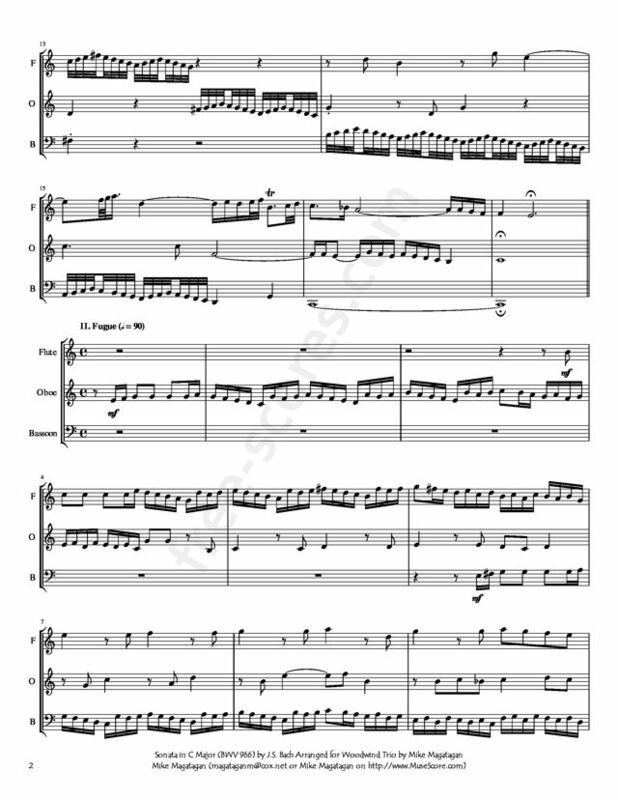 Bach's arrangements of the noncontrapuntal movements consist of richly figured but generally exact clavier transcriptions of Reinken's in-strumental originals. The gigues and allegro movements, by contrast, are not simply expanded but are actually newly composed. Bach's own interest extends to the unfolding of the imitative allegro movements in the sense of a formal fugue. Hermann Keller" and Ulrich Siegele have analyzed Bach's Reinken transcriptions from various points of view, and they stress the structural similarity and chronological proximity to the fugues of Well-Tempered Clavier I. However, their discussions are based on Spina's dating of the works in connection with Bach's Hamburg trip of I720. New discoveries regarding the manuscript sources of the arrangements force one to abandon this dating and think through the style of the pieces once again. The earliest source for BWV 965 and 966 is in the Deutsche Staats-bibliothek, Berlin, where the arrangements are entered in the hand of Johann Gottfried Walther (probably around 1712 at the latest). These arrangements by Bach were likely created before 1710, and probably even earlier. Speaking in favor of this early date is the direct stylistic connection with Bach's fugue compositions after Italian trio sonata models: Fugue in B Minor BWV 579, after Corelli, op. 3, no. 4 (Rome, 1689); Fugues in A Major, B Minor, and C Major BWV 95o, 951/95 IR, and 946, after Albinoni, op. I, nos. 3, 8, and 12 (Venice, 1694); and Fugue in C Minor BWV 574/574a/5746, after Legrenzi, op. 2, no. Ix, "La Mont Albane" (Venice, x655).68 The similarities of genre (Reinken's sonatas represent a North German variant of the Italian trio sonata, standing between the Legrenzi type and the Corelli and Albinoni models)" already point to a distinct link, implying that Bach became occupied with the chamber music of the passing seventeenth century, together with its performance practices, when this repertoire was still current." A bit of chronological evidence for the early dating of Bach's Italian transcriptions can be gleaned from the sources, for the early version of the Legrenzi Fugue BWV 574b is handed down in the Andreas Bach Book." The Andreas Bach Book also contains open scores of the first two Trio Sonatas from Albinoni's op. 1. The sister manuscript, the Moller Manuscript, contains an arrangement of a Reinken fugue" made by Peter Heidorn, which completes the chain of circumstances that appears to confirm the North German origin of this sort of keyboard transcription of instrumental sonatas. This situation seems to be an early parallel to the Netherlandish origin of the concerto transcriptions for keyboard instruments." In this case, Reinken would seem to be the logical connecting link. Thus Bach's arrangements of Reinken's works must be grouped with his arrangements of Italian trio sonatas, especially with regard to the technical, formal, and stylistic evolution of the Bach keyboard fugue as it unfolded before 1710." 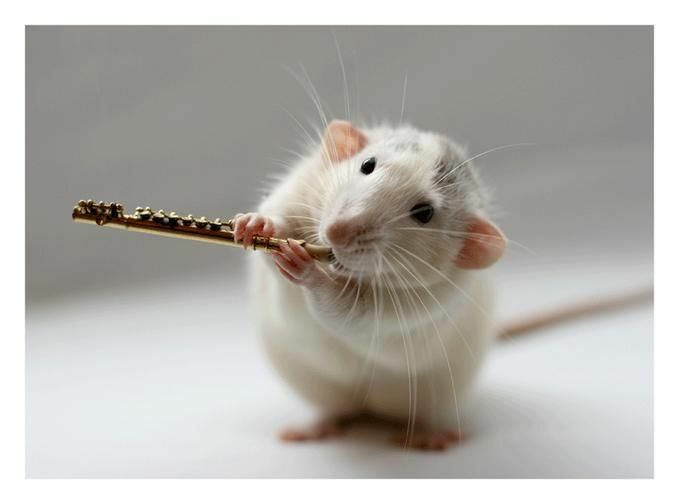 In this context the following theoretical considerations—in which the musical analysis must necessarily remain cursory—can be set forth. Although originally written for Harpsichord. 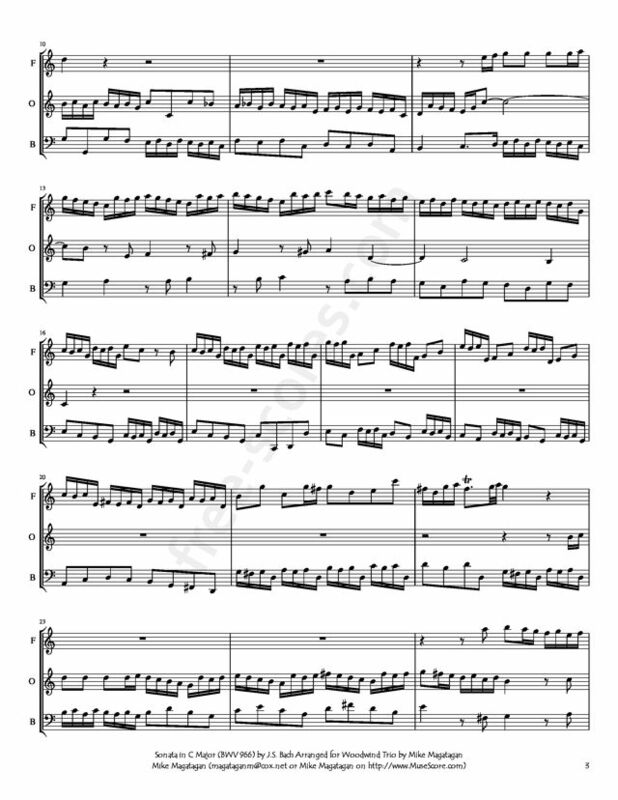 I created this Arrangement of the Sonata in C Major (BWV 966) for Woodwind Trio (Flute, Oboe & Bassoon).